Since inadvertently watching the end of an early season of Top Chef, I've had an interest in Richard Blais’ career. Unfortunately, while watching him on Top Chef All-Stars, eating a few of his burgers in both Atlanta and Birmingham, and following him on twitter are all well and good, I never had the opportunity to eat at either BLAIS or One Midtown Kitchen when he was at the helm. Needless to say, when Jennifer told me that he had opened a new full service restaurant in Midtown, I was eager to give The Spence a try. Luckily, my flight out west wasn't until three and a liquid nitrogen modified lunch never hurt anyone. After burgers with Flip and hot dogs with HD1, what is Blais trying to do with The Spence? According to Kessler, Spence is Blais’ attempt to put creativity for creativity’s sake in his past and focus on “good, simple cooking”. I’m not sure about either’s definition of simple cooking but I’m all for trying a restaurant with bone marrow and a Juicy Lucy on the menu. 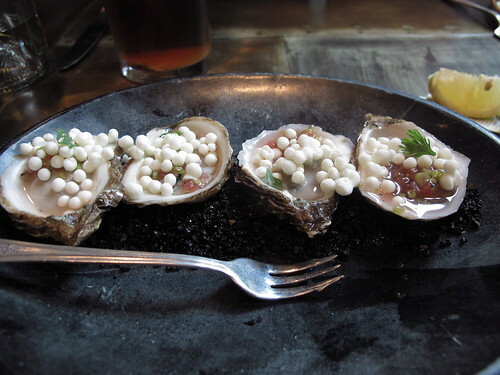 However the bone marrow would have to wait as the first thing to our table was an order of oysters and pearls. As soon as I read the name, I immediately thought of dinner at Per Se and I was interested to see if Blais would copy Keller’s signature dish or take things in his own direction. It figures that my first choice would be the dish using liquid nitrogen. 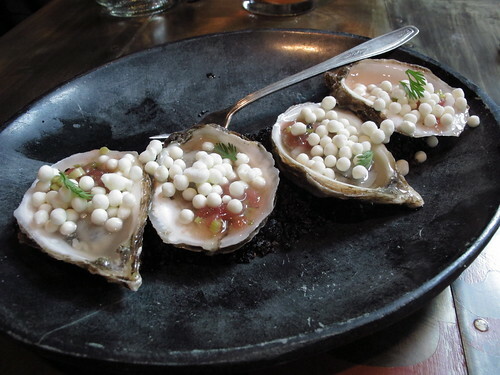 Bearing little resemblance to Keller’s dish, these oysters and pearls feature tiny, briny oysters, an ice cold watermelon mignonette, and horseradish cream pearls all on the half shell. 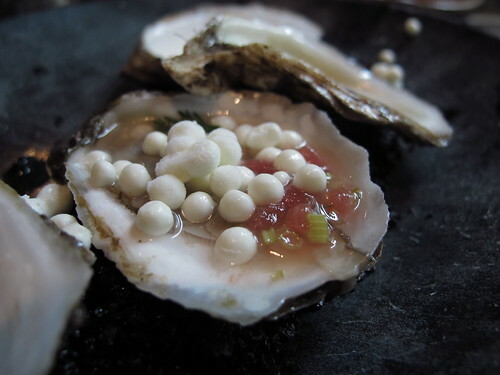 While each oyster tasted more of cilantro & celery than watermelon, it was still a dose of super chilled oyster salinity that ended with a pop of horseradish pungency as each pearl melted in my mouth. 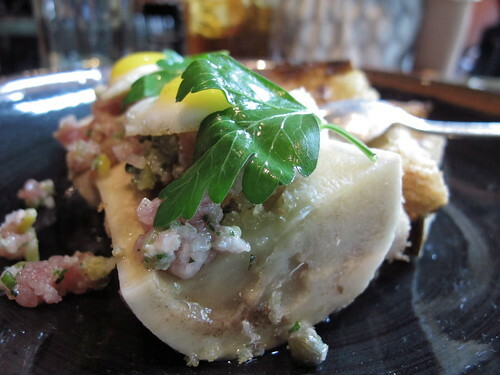 It’s hard to know where to begin with the roasted bone marrow. 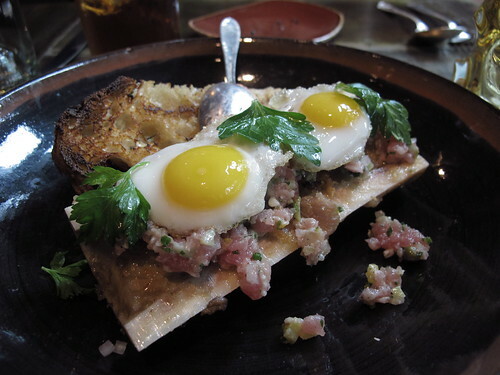 The combination of bone marrow, tuna tartare, and fried quail eggs is certainly an odd one but it seemed to work. 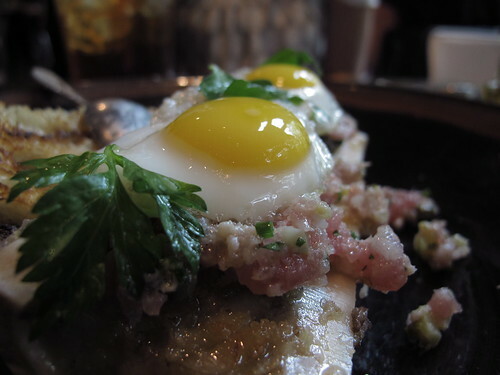 As you’d expect, the bone marrow was unctuous and fatty, with a touch of beefiness on the side, but when combined with the runny yolk of a quail egg, things were elevated to a new level of delightful greasiness. Thankfully the parsley provided a nice astringent bitterness to cut through the richness of an egg that tastes like it was fried in beef fat. At the start, I couldn’t place the flavor of the tuna, it’s unique but relatively subtle taste seemed lost in the fray but as I kept eating I could eventually pick out its lemon scented flavor. I’m still not quite sure where it belongs in this combination of flavors but all the components seem to work quite well together albeit in quite a messy fashion. Having passed on our usual lunch choice of Buford Highway pho, it’s seemed a little ironic that I drove to midtown to get the sole vaguely Vietnamese dish on the Spence menu. 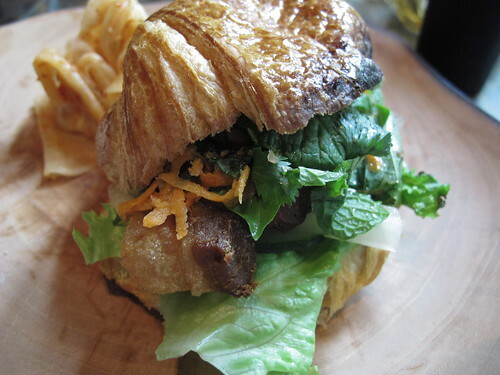 I say vaguely because I have yet to encounter a croissant based banh mi but the combination of roast pork on a French style of bread is all too familiar. 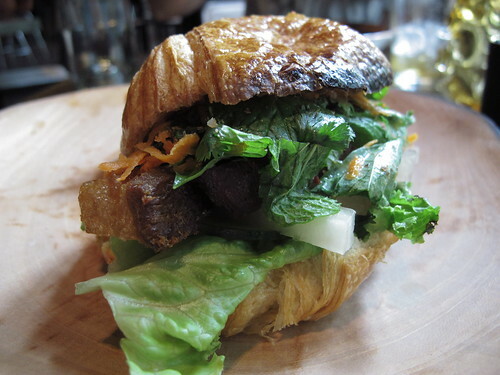 Since pork belly is never rich enough on its own, this sandwich needed a rich base to start. 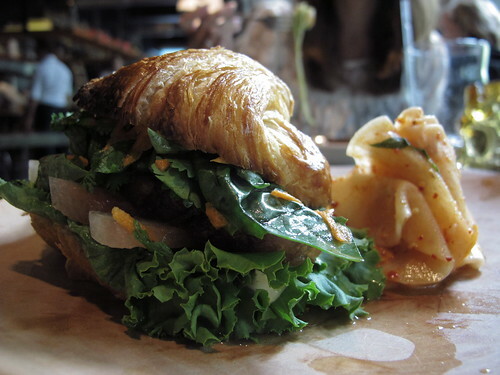 The golden brown, buttery, and fiddly croissant fit the bill. I say fiddly because as soon as I picked up this banh mi, things began falling out. Scrambling to get a bite, I was rewarded with pork belly seared to a crisp and a bevy of pungent, pickled vegetables. Watermelon, cilantro, and carrots provided a satisfying crunch and a welcome foil to the pork belly and mayo. One double edged aspect to this sandwich was the juiciness. With every bite quite literally dripping with flavor, the croissant had almost dissolved by the time I was finished. Unfortunately, the bread’s texture wasn’t the only two sided concern. Although they provided a nice texture and vinegary flavor, the pickled veggies far and away dominated the dish. The pork was left to a supporting role, adding extra depth in the form of fattiness, crunch, and sheer yet reserved pork flavor. It was an uneven partnership but it still made for a unique alternative to a banh mi. 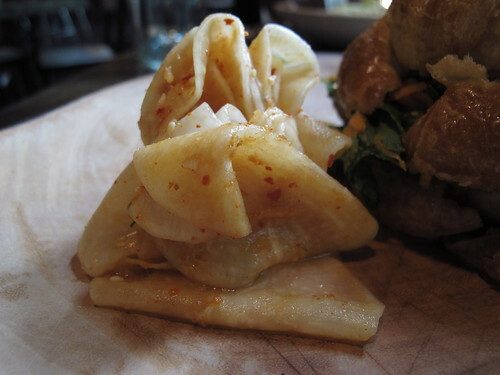 If there was component that seemed completely out of place it was the kimchee. Pungent with a chili pepper tail, the kimchee was nice on its own but I couldn’t decide how it fit into the sandwich. 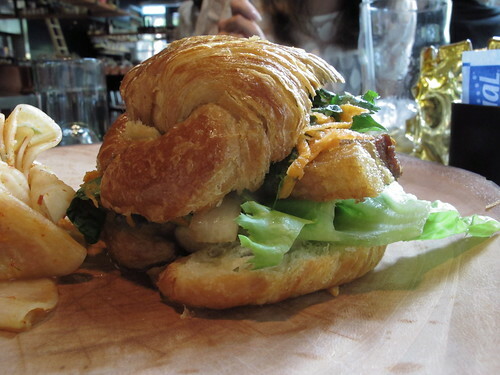 When I added slices to the croissant, their flavor was lost in the sea of carrots and cilantro. Tasty as they were, the kimchee slices seemed like an unwarranted addition. If you read any of the major reviews of Spence (Kessler, Atlanta Magazine) the main worry seems to be Blais sticking to this project. Will Blais stick to Spence or will he continue moving forward at a breakneck speed towards bigger and newer projects? I have no real answer but if it’s any consolation, Blais did stop by Spence while I was at lunch. It seemed to be little more than a quick meeting with the chefs, but it was nice to see him in the restaurant. As for the food, these three dishes were an interesting look at what Blais can do with the idea of “good, simple cooking”. At the very least I’ll be back for dinner and to try that Juicy Lucy. all of these dishes are ones that on paper sound so interesting and intriguing...but I must admit, looking at the pics, my excitement has drained. 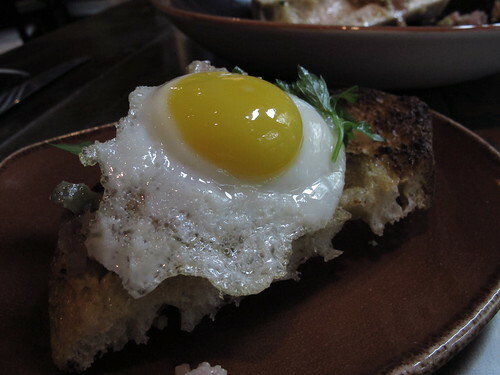 Esp the egg dish (and the description...egg in beef fat? Doesn't really appeal...).